BEE Basic Electricity Electronics question paper May 2016 - padhaee "
BEE Basic Electricity Electronics question paper May 2016 – The mumbai university FE First year question paper that is a common subject for all engineering students is easy to crack if you practice. (a) A resistor of 5? 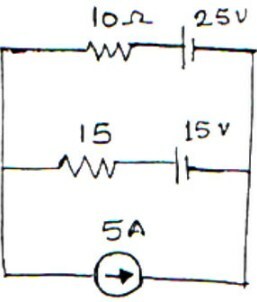 is connected in series with a parallel combination of a number of resistors each of 5?. If the total resistance of the combination is 6? find the no. Of resistors connected in parallel. 1(d) What is the necessary condition for resonance in series circuit. Derive expression for resonance frequency. 1(e) What is the relationship between line and phase values in star and delta connected load. 1(f) Draw and explain the phasor diagram of 1-? 1(g) Define rectifier and state diff. Types of it. (i) the current I (ii) V1 and V2 (iii) Pf. Draw the phasor diagram. 2(c) A 150 KVA transformer has iron loss of 1.4 kW and full-load copper loss of 1.6kW. Det. (i) the KVA load at maximum efficiency (ii) max efficiency at 0.8 lagging Pf and (iii) efficiency at half load and 0.8 lagging Pf. 3(a) A balanced three-phase load connected in delta, drawn a power of 10kW at 440 V at Pf 0.6 lead, find the values of circuit elements and reactive volt-amperes drawn. 3(b) The wattmeter reads iron losses in OC test and reads copper losses in SC test of a transformer. Justify. 3(c) What is meant by filter. 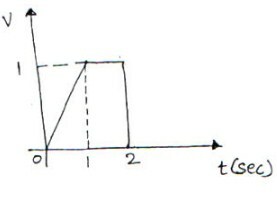 3(d) Draw and explain O/P characteristics of transistor in CE configuration. 4(a) Using source transformation tech. Calculate voltage across 4? 4(b) Find the average and rms value of the waveform. 4(c) The power in a 3-? 5(b) For the shown ckt, find supply current, current in each branch and total Pf. 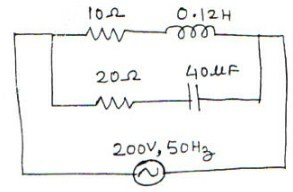 Draw equivalent ckt of transformer reffered to primary and secondary side. 6(a) Using superposition theorem, find the voltage accross 4K? 6(b) A series R-L-C circuit consists of R = 1000 ?, L = 100 mH and C = 10?F. The applied voltage across the circuit is 100V. (i) Find the resonance freq of the ckt. (ii) Find Q of the ckt at resonant freq. (iii) At what angular freq, do the half power points occur. (iv) Calculate the bandwidth of the ckt. 6(c) Show that the total power and Pf. In a 3-?